How to have a healthy happy horse. Winter in Colorado is quickly approaching and I am nervous about it. I have never gone through a hard winter with horses. In our area many people take their horses south to ride out the winter but we are keeping ours here and are taking steps to keep our guys healthy and happy regardless of the weather. Our Fire mare, Cerise, grew up in Texas so she has not seen much snow or ice. Tanq, our Earth/Metal gelding grew up in New Mexico, but spent last winter in Denver, so he has seen more cold and snow. I think Tanq shared his experience with Cerise because she has been eating and gaining weight like I have never seen her do before. Cerise does not have the long, furry coat that Tanq has but her hair is very thick. We have been keeping free choice hay out in a slow feed net and both horses are fat as ticks. I actually had to add some timothy grass hay to their orchard grass/alfalfa mix because I felt they were getting too fat. We have moved our water trough out of the shelter so it can get more sun exposure to keep the ice down. We also have a tank heater available for really cold temperatures. We also have a board in our trough to make sure no animals (our cats) fall through thin ice while trying to get a drink. We have brought in coarse river sand and are spreading it in the pen around our shelter. Our hope is that the deep sand will provide better footing when it freezes than the hard pack clay that is native to the area. We also put the sand in the shelter but we can always add shavings or straw if the horses need a soft place to lay down when it is really cold. We have blankets for both horses but we don’t intend to use them unless one of the horses is sick or gets wet and chilled. I believe that horses that are healthy, in good condition, and have a good winter coat will stay warm if they have a way to get out of the wind and moisture. Blanketing can actually cause a horse to get overheated and sweat under the blanket if it is not removed as the temperatures warm up. Better to let the horse do his own thermoregulation by lifting or laying down his hair as needed to provide him insulation. Our barn is full of hay to last us well into spring. We will continue free choice hay feeding over the winter since there is not much grass available for grazing. I am not sure how I will manage heavy snow around the shelter. Cerise is a horse that likes to move so I hope she will plow her own path but if not I am ready to shovel or get out the snow blower so the horses will be able to get exercise even if the snow is deep. I am sure that I will learn a lot going through this first winter and I am looking forward to the experience. We are very happy to announce that our new website is up and running so be sure to surf on over to www.holistichorsekeeping.com and check it out. One of the great new features is that this site is very mobile friendly making it easy to order your horse products and informational materials right from your Smart phone or tablet. You’ll still find lots of great free resources and quality products just in an easier to locate format. We’d love to have your feedback on what you think of the new site. Be sure to browse through the store and check out some of our new product lines too like Pharm-Aloe aloe vera juice, Ration Plus, Kentucky Performance Products, and U.S. Chia seeds. The new self-paced online course is open to anyone interested in learning more about the Horse Temperament Types. It was created to share information about the eleven Horse Temperament Types as explained by Madalyn Ward, DVM. Dr. Ward has been a pioneering voice in the field of holistic horse care for over two decades and she breaks new ground with the Horse Temperament Typing system. Her cutting edge casework now extends to helping horse lovers find their perfect equine match or better understand their current equine partner. If you want to learn more about determining the temperament type of your horses, this course is the one for you. You can sign up and find more information at http://horsetemperament.com/class.html. If nutrition or homeopathy is more what you are looking to learn about, take a look at the individualized Mentoring Program to get one-on-one instruction with Madalyn Ward, DVM. Unless otherwise attributed, all material is written and edited by Madalyn Ward, DVM. Copyright (c) 2016 HolisticHorsekeeping.com and Madalyn Ward, DVM. All rights reserved. 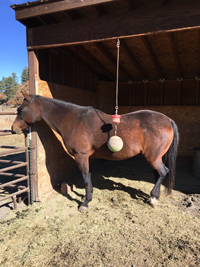 This entry was posted in General Horse Care, Newsletters and tagged horse, horse care, horses, winter horse care on November 1, 2016 by Madalyn Ward, DVM.